I went to see the new Fantastic Four movie a couple weeks ago. (Yeah, I’m behind on this.) It was a free night for me and I’d been meaning to go so I could do this review. Given the reviews and the fact that it was a Tuesday, I expected to be the only one in the place. When I got there though, there were 2 people and a couple more showed up later. The 2 original people stuck around with me to see if there was a teaser scene in the credits. There weren’t, so if (for some odd reason) you do go to see the movie, don’t bother waiting for one. I was talking to the guy on their way out of the theatre and they thought the movie was bad. I have to say I agree with them. Leading up to the movie, there were a number of complaints about how the movie was going to be. One of the first big things was the revelation that Johnny Storm was going to be black. The big thing about this is that people are like “Back then, they didn’t put blacks in comics so we need to correct that.” Fine. Correct it by adding new black characters instead of changing old ones. Then we found out that Sue wasn’t actually going to be his sister but was adopted. Then we started seeing pictures and noticed that the Thing was naked and neutered. There’s dramatic license and then there’s just loosely connecting it to the original at all. When a moratorium on reviews was put out until the day of release, people knew things weren’t going to be good. Even with the theory that the movie was created just to keep the rights, why waste money on a bad movie. We start out with a Reed Richard who is a little kid but has somehow started designing a flying car and a teleportation device. His teacher berates him for wanting to be a scientist and makes fun of his projects because they are way too advanced so they had to be made up. Seriously? He sneaks into a salvage yard that happens to be owned Ben Grimm’s family. (We see Ben’s brother beating up on him saying “It’s clobberin’ time.” His brother? Seriously? Reed get a power supply he needs and Ben helps him test it out, which blows out power for the city. Jump forward to high school where Reed is in a science fair with his “partner” Ben. (Obviously, Reed did everything and Ben’s just there because he’s Reed’s friend. He comes off as a total loser who seems totally lost during the scene. He’s not that bright and he’s way to scrawny to be the Ben Grimm we’re used to. (Reed’s bigger than him.) The teacher he had as a kid is somehow a judge in this contest and when he uses his teleportation device, the guy disqualifies him saying it’s about science and not magic. WTF? None of the other judges even comment on it. The whole thing is ludicrous. Then Sue and her father walk up and tell him that his device is actually transporting between their world and (miraculously and coincidentally) the same world they’ve been teleporting stuff to. Somehow, all the scientists there have never been able to bring it back like Reed has though. Guess they weren’t all that bright there after all. Sue has the worst hair ever and it stays that way throughout the movie. I think they got the 5 year old kid of someone on the set to be her hairdresser. That is unless they made her look that bad on purpose. Sue’s father ends up offering Reed a scholarship to the Baxter Foundation. Next thing you know, he’s at the Baxter Building. Yup, they got it in there but as a school/science lab. After Ben leaves Reed there, he goes off to the library which is full of really old and outdated books which has Reed all excited. (You’d think he’d want up to date stuff or that they’d at least have a lot of stuff in digital format.) Sue then “reads” Reed and says everyone is predictable because she can figure out what they are like and will do. Sounds like she’s one step away from psychic. While this goes on, Sue’s father talks to some government people and goes off to recruit Victor Von Doom, who was part of his team before and uses Reed as a taunt to get him to come back. Toby Kebbell who plays Victor is the only real eye candy in the whole movie in my opinion. Finally, we get to meet Johnny who is a bad boy wannabe who is trying to prove he can be a street racer… in a POS car that he crashes. Ends up he’s just trying to compensate for actually belonging at the Baxter Foundation. Ben was never a smart one but Sue and Johnny were never even near his league either. So, once he crashes his car, his father brings him back into the fold. There’s a whole “working together to build it” montage leading to them showing the government guys how they can send a monkey through to the other dimension and bring it back. The bureaucrats love it and decide to get a group of dimensional astronauts together to take the first trip even though the plan was for the team to do it first. Sue’s father goes off to try to talk to them. While that is going on, Reed, Johnny, and Victor get drunk and plan to do the trip on their own. Being the buddy that he is, Reed calls Ben in the middle of the night telling him to get all the way into the city right then. The 4 (with Victor but without Sue) jump into the machine (It just happened to have 4 pods. What a coincidence.) and trigger the transportation from inside and transport to the other dimension. It’s an odd barren world with green energy coming up from the ground in areas. The group plants a US flag in the ground which causes it to split and release more energy. Victor wants to go investigate though and somehow, him reaching down to an energy spot sets off a huge cascade and the guys have to run and try to get up the cliff back to the transport device. Victor falls back down into the energy and the other 3 run for their pods. They can’t reactivate the machine but luckily Sue noticed they had used the device and was in the control room. As she tries to get the manual override to work, Ben’s door won’t stay shut and he gets bombarded by tons of rocks. Don’t worry. It gets worse. The green energy turns into fire and blasts through the glass in Johnny’s pod. The only thing that seems to happen to Reed is bright light. (I guess they couldn’t think of anything good for him that wouldn’t have made it truly unbelievably stupid.) When Sue gets them back, an energy pulse gets set off and blasts through the control room which is how Sue gets affected. This has got to be one of the worst interpretations of their origins that I have ever seen. Sue wasn’t even with them. She just gets stray energy on re-entry and the other 3 are more like a joke. Back with the rest of the team, Reed works to help create a new machine that can transport a team. The team goes over to the other dimension where they find a man covered in metal with glowing green energy coursing through it. He has a raggy hood over him. Yes, this is Doctor Doom. In this version, he’s a telekinetic who is fully coated in energized metal. He actually looks more like some really old school sci-fi robot from a B movie with glow sticks put through the metal. Can you say tacky? On top of that, whenever a bullet hits him, there’s all these green sparks flying off of him. After seeing what they did with Doom, the others really don’t seem quite as bad. After killing Dr. Storm, Victor goes back to the other dimension which he has some sort of connection with now and and the team follows him through some gateway that is left open because Victor is sucking everything in to the other dimension to try to destroy the Earth. This is absolutely nothing like the Doom everyone knows. He wants to rule the world, not eliminate it. In the end, Johnny destroys the stuff Doom was using draw stuff through the portal, which apparently kills Victor too, and then escape back through it to get home. They do this through Sue creating a bubble around the the three of them who can’t fly and…. well… Fly them home in it. I guess this is Sue’s version of the invisible jet. It’s pretty funny to see this since not long before, she could barely levitate. They get back and the military wants to keep using them but they say no and that they want their own space now that they can use to create stuff. I guess the government says yes because next thing you know, they are flying off to another building. Any by flying, I mean that Sue is actually flying across the country with Reed and Ben and keeping up with Johnny. Seriously? How powerful is she supposed to be? And, no,they are not in the Baxter Building. It’s some building built up in the mountains that they call Central City. Yeah, I had to look that one up too. It turns out that Central City was the name of the city the 4 of them lived in before they went up in the rocket. So, it was the actual name of a city, not a big mountain base. And then things go to worse as they try to think of a name for the group. The stuff they come up with are really stupid and then Ben comments on how the new place is fantastic and they take the name from there. This movie is just a travesty. 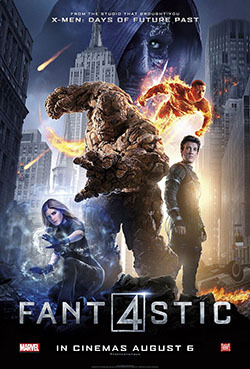 If you happen to be one of the people who didn’t like the first Fantastic Four movie, you’re really going to hate this one. I liked the first one and I still hate this one. I can’t believe they actually wasted that much money on this. I checked online and opening weekend ticket sales for this movie were $26.2 million. Ant-Man, who most people have never heard of, did $58 million which was the second lowest in Marvel Studios history. So, yes, this movie made less than half that opening weekend. I think that about says it all. And with that, I’ll send this out for you all to see. And I think you’re better off seeing this (as late as it is) than this movie. Save your money.